Happy 2014. It’s official. This blog is never going to end. Let’s get right to the gossip. So it’s Friday. I’m substitute teaching a 7th grade history class and we’re learning about slave vs. free states. Really uplifting stuff. I’m twitter dumb-as-hell, so although I tweeted back, it’s not in the thread because I don’t understand such things. I did tweet that he should meet me already and that I’d love a link to his Craig’s List ad. So here’s the thing. 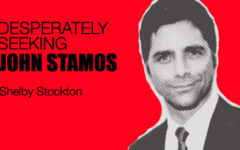 Stamos responds to @melaniejade_ and not me???? I’m the one doing all of the work! He hates me, y’all. He downright hates me. PS- I was supposed to write this post Friday, but my substitute teacher duties became too overwhelming.